Here you can find UK newbie information, visiting places, education, qualifying tests, UK visas, cost of living, UK travel, accommodation, food, medical and health services, UK job prospects, calling cards, UK TV networks, exchange rates, UK shopping, movies and UK cassette rentals. Theme parks or amusement parks can provide days worth of excitement and entertainment with something to suit everyone in the family. Alton Towers Theme Park is the UK's biggest theme park and features a wide range of exciting rides and adventures for the whole family including a waterpark. Thorpe Park is one of the leading leisure parks in Europe. Drayton Manor is a Theme Park and Zoo, with some of the scariest rides in Europe. Blackpool Pleasure Beach is the UK's top theme park attracting over 5 million visitors a year. London Eye offers visitors spectacular views of England’s capital from 135m/443ft high in a giant moving wheel. Chessington World of Adventures is situated just 12 miles from central London and is a theme park and zoo. Due to its long history, the UK boasts a large selection of castles, palaces and impressive stately homes in various states or repair. Buckingham Palace is the Queens London residence and is used to receive and entertain guests on state, ceremonial and official occasions. Hampton Court Palace was King Henry VIII’s favourite palace and has probably the most famous maze in the world. Chatsworth House is one of Britain’s most famous historic houses and its 1000 acre garden was designed by Capability Brown. Windsor castle is the largest and oldest occupied castle in the world and is one of the official residences of the Queen. Warwick Castle Mediaevel England is bought back to life at Warwick Castle with displays and shows both inside and out. Leeds Castle is listed in the Domesday Book and has been a royal residence for six of England's medieval queens and a palace of Henry VIII. Barnard Castle sits high above the town of Teesdale in County Durham and dates back to Norman times. Blenheim Palace is a large country house in Oxfordshire, home to the 11th Duke of Marlborough and birthplace of Winston Churchill. Tatton Park is a 2000 acre estate in Cheshire comprising a Mansion, Deer Park, Gardens, Farm and an Old Hall. Hever Castle in Kent is famous for once being home to Henry VIII's wife Anne Boleyn and dates back to 1270. Corfe Castle is a ruined castle that was used as a fortress for 600 years on the Dorset coast. Kensington Palace has been home to the royal family for over 300 years and was where Diana Princess of Wales resided. Hatfield House in Hertfordshire is a fine Jacobean House and 1000 acre estate that is home to the 7th Marquess of Salisbury. Dover Castle is the oldest fort in England and has been strategic in the countrys defence, including both world wars. Alnwick castle is located in Northumberland and is the 2nd largest inhabited castle in England dating back to 1096. Donnington Castle is a ruined mediaeval castle situated north of the town of Newbury in Berkshire. Arundel Castle is a magnificent stately home in West Sussex containing some of the finest interiors in the world. Kenilworth Castle is one of the most breathtaking castle ruins in England. Bamburgh Castle stands on a basalt outcrop on the edge of the North Sea at Bamburgh, Northumberland. White Castle Dating back to Norman times, White Castle was one of three castles that formed a triangle of fortresses to control entry into Wales. Lincoln Castle has over 900 years of history during which it has operated as a castle, a prison and a court. Newark Castle is situated on the banks of the Trent in Newark town centre and has done so for nearly 900 years. It is where King John died in 1216. Tintagel Castle stands in ruins on the dramatic cliffs of the Cornish coastline and is famously linked to the legend of King Arthur. Raby Castle in County Durham was built in the mid 14th century and contains a huge collection of art treasures. There are many nature reserves and natural spaces in UK cities including parks, gardens, safari parks and zoos. London Zoo is located in Regent's Park and is the world's oldest scientific zoo. Chester Zoo is one of the best in Britain with over 7000 animals and 400 different species. Flamingo Land is the UK's only Theme Park, Zoo and Holiday Village, all set in over 375 acres of North Yorkshire parkland. Regent's Park is one of London's Royal parks and comprises of 410 acres of parkland situated in Westminster and Camden. Kew Gardens The royal botanic gardens contain glasshouses, conservatories, a herbarium, library and museums as well as extensive gardens. The Eden project is a living theatre containing millions of plants in two huge greenhouses, one a tropical climate and the other Mediterranean. Colchester Zoo has over 2,500 animals, birds, reptiles and fish for visitors to see. This includes Tigers, Lions, Elephants, Orangutans and Giraffes. Edinburgh zoo is one of the city's top tourist attractions and is one of Europe's leading conservation centres. Bristol Zoo occupies a 12 acre site in the heart of the city and has over 400 species on view. Britain is home to many splendid art galleries and museums covering arts and knowledge. Science museum explains and questions a variety of technological advancements, from space and travel to food and medicine. National Gallery houses one of the greatest collections of Western European painting in the world. British Museum houses a world collection of art and antiquities from ancient and living cultures that spans two million years of history. Natural History Museum is home to one of the largest natural history collections in the world from microscopic slides to mammoth skeletons. The National Museum in Cardiff is an art gallery and musuem charting Wales' history. The V&A museum houses art and design artefacts spanning 3000 years of history and from all corners of the world. Britain is littered with ancient and historic sites and landmarks including statues, bridges and diverse architecture. Stonehenge is a circle of ancient stones erected between 3000BC and 1600BC. Royal Albert Hall is one of London's most famous art venues and hosts the annual summer proms. Monument is the tallest isolated stone column in the world and was built as a memorial to the Great Fire of London. Tower Bridge Exhibition takes visitors behind the scenes of this famous London bridge and tells you of its history. A range of other attractions including markets, shops, parades and more. Lake District attractions are among the finest in the country. Places in the district to visit range from castles to Lake Windermere. Discover the secret world of the lakes at Britain’s biggest freshwater aquarium. Beautifully preserved Grasmere home where England’s finest poet William Wordsworth wrote his best-loved poetry. A highly praised all weather attraction that has something for everyone. An extensive route network links the main Lake Windermere settlements. The South Lakes Wild Animal Park was built to put animals first. It is one of Britain's best conservation parks with unique interactive close up encounters with wild animals. In addition all the various Lakeland areas, lakes, villages and towns make enjoyable day trips. They include : Keswick, Penrith, Kendal, Windermere, Ambleside, Grasmere, Ullswater, Coniston and Buttermere. Brighton is one of the most vibrant, colourful and creative cities in Europe. Cosmopolitan, compact, energetic, unique, fun, lively, historic, young, exotic and free-spirited, it's a city like no othe. Nestling between the South Downs & the sea on the stunning south coast, Brighton offers everything from Regency heritage to beachfront cool. Scotland is a land of great beauty a fabulous coastline and more castles and ancient monuments than other countries of similar size Whilst Visiting Scotland a warm welcome always awaits you. If you are Visiting Scotland you will see a country at one with its past but also with the future. Whether you want to see Castle, great scenery, or Scotlands crowning glory the new Parliament, Scotland is the place to visit. Bath is a unique city; its hot springs, Roman baths, splendid Abbey and Georgian stone crescents have attracted visitors for centuries. Set in rolling Somerset countryside, just over 100 miles west of London, it is a beautiful and unforgettable place to visit. Oxford offers its visitors a huge choice of group and family activities and unique, exciting attractions that you really need more than just a day to experience the true vibe of the city. The Bodleian Library, The Ashmolean Museum, The Botanic Gardens and Christ Church Cathedraland university colleges are just a few of Oxford’s world famous attractions. The Peter Harrison Planetarium is a state-of-the-art planetarium at the Royal Observatory in Greenwich London. Bluewater is the most innovative and exciting shopping and leisure destination in Europe today, with some of the biggest and most influential names in retailing under one roof. Harrods is one of the world's largest and most luxurious department stores and is situated in prestigious Knightsbridge, London. Southend has seven glorious miles of seafront, the longest pleasure pier in the world and a host of exciting events and festivals all year, it's no wonder Southend-on-Sea leaves visitors smiling time after time. 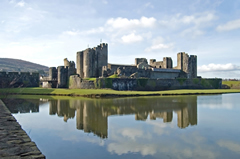 Caerphilly is located in the heart of Southern Wales and only 20 minutes drive from Wales' capital city -Cardiff. The stunning Brecon Beacons National Park is on the doorstep, making the county borough of Caerphilly the ideal location for a short break. Bridgend is located on the Southern Wales coast between the cities of Cardiff and Swansea. As you would expect in Wales, there are ancient castles, fascinating towns, picture-postcard villages and ancient heritage along with festivals and events throughout the year. This makes it the ideal holiday destination with something new and exciting to do every day. Bristol is made up of a series of districts and areas, each with their own unique character and charm. Whether you are a culture vulture or you are coming to Bristol for your very own urban adventure. Bristol was once one of the most important trading ports in England, and the city’s links with the ocean span hundreds of years.Bristol enjoys a fantastic location in the West Country, with some of England's finest countryside stretching out in all directions from the city. Cambridge is a compact cosmopolitan city with outstanding architecture old and new. The beauty of its ancient centre is preserved with its walkable medieval streets, college courts, gardens and bridges. Yark is a city of contrasts and exciting discoveries, York is a place where the old encompasses the new and the commonplace meets with the unexpected. Broaden your mind with a visit to world class museums or a variety of festivals held throughout the year catering for all ages and interests. Blackpool plays host to hundreds of top shows, concerts and special events each year and the events calendar continues to grow and grow. Blackpool is renowned as the Dance Capital of the World. Boasting two magnificent ballrooms, the resort regularly hosts major national and international competitions. Cornwall has emerged as one of the world's iconic destinations. From the dramatic coastline of the north to the sheltered bays in the south, from ancient moorland to soft river estuaries. An aggressive attack on someone by a group.